Whether you want to admit it or not, there are probably some things about content marketing that you just don’t feel like you have a solid grasp on. But rest assured, you are not alone. 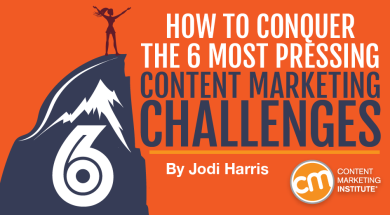 As part of our annual Benchmarks, Budgets, and Trends research, we ask content marketers to reveal the components of the job that are challenging. Though it may seem like content marketing just comes naturally to some companies, it turns out that some struggles are universal. If you, too, are looking for ways to overcome these stumbling blocks, the tips that follow may help you find your footing. But don’t forget: If you are struggling with more than one of these challenges, your best bet is to go back to the basics and document your strategy. How to accomplish it: While a definitive definition of the term may be elusive, it’s a lot easier to recognize the sure signs that the content you’ve created is engaging: It gets consumed, commented on, and shared by your target audience. An obvious point: Your article or blog post should be extremely clear as to what it’s trying to say. A structure: Every article needs to have a clear structure, both in terms of its logic (i.e., is the discussion organized and presented in a coherent way?) and its visual construction (i.e., how easy it is to follow the conversation on the page). A conclusion: How does your article end? If it concludes with a whimper, then your readers will whimper away without engaging. If it ends in confusion, then your readers feel the same. If it ends abruptly, your readers won’t know what to do. A question: Not everyone does this, but questions make people think, and when readers reach the end of an article, you want them to be thinking about what you said – and what comes next. A bit of controversy: While it doesn’t work well in all situations, controversy can get readers more emotionally invested in the conversation, especially if they have a personal stake in the issue. It’s easy to see why content marketers would be concerned with engagement – content that doesn’t resonate with an audience is a waste of precious time and resources. But content variety is a more complex issue, since it’s often driven more by a fear of missing out than a true need for greater content diversity. Joe Pulizzi often warns content marketers against doing too much at once, pointing out that many of the most successful media brands – including The New York Times, ESPN, and Huffington Post – started by mastering the conversation on one core channel before diversifying their content offerings. Instead of blindly pursuing variety, Joe recommends that you first focus your energy on producing the best content possible for your audience on a single platform or format. Only once that goal has been achieved should you consider branching out in new directions. Regardless of whether you are building your content kingdom on a single platform or boldly going where your brand has never been, remember that it may not always be necessary to start your content conquests from scratch. A much more efficient way to increase your content volume and add diversity is to curate the content you’ve already published and rework it so that it fills a new purpose. Turn the data from a research report into graphic storytelling. Take clips of audio conversations recorded for Q&As and interviews, add some narration for context, and publish as narrative podcasts. Turn on your video camera as you read the advice from a how-to blog post or e-book. Add a few relevant screenshots, photos, or other illustrations, and voila – a video tutorial. Turn a live presentation into a whiteboard-based masterpiece with the help of a graphic recorder. Put your ideas in motion by turning them into interactive gifographics. While your brand doesn’t necessarily need new content for every channel or format out there, it’s important that the content you do choose to publish is delivered on a schedule that your audience can depend on and that your team can maintain. In fact, failing to publish content on a consistent basis is one of the surest signs that your content marketing is doomed to fail. Keep an editorial calendar: This most steady and stalwart of tools in the content marketer’s arsenal is an essential component for managing the life cycle of our organization’s content marketing program. We’ve shared this several times; but in case you’ve missed it, here’s an editorial calendar template you can customize to help you keep your efforts organized and on track. Establish a repeatable workflow: As Jesse Noyes points out, repeatable workflows save time and protect you from frustration. They also provide visibility and accountability across your organization, as key stakeholders know their responsibilities, their deadlines, and how their efforts contribute to larger organizational priorities. Gather your stakeholders: Write down the roles and colleagues who participate in creating and launching your content. Document your distribution points: These can include your owned channels and social media accounts, as well as the software tools and internal collaboration systems that are part of your distribution process. Align your process with your people: The goal is to marry the roles with the tasks that need to be completed. Set/adjust your schedule: Deadlines are necessary to establish accountability. They also should include some flexibility so they can be shifted to reflect your organization’s reality. As a content marketer, you recognize that measuring the performance of your efforts is part and parcel to everything you do – but that doesn’t mean it’s easy to understand how to ascribe a tangible value to them. In her post on the topic, Cathy McPhillips recommends starting the measurement process by documenting two key pieces of information: your marketing goals and the key performance indicators (KPIs) you’ll use to determine if your content is helping you achieve them. Know your goals: You can’t determine whether your content is effective if you haven’t outlined what its ultimate purpose is – the business reason you are creating content in the first place. Brand awareness: Are you a start-up that needs to build or increase your presence in the marketplace, or are you having difficulties distinguishing your business from your competition? Lead generation/lead nurturing: Are you having trouble generating sales leads or moving qualified leads down the funnel? Customer loyalty: Are you having trouble retaining your customers or servicing their needs? Check for signs of progress: If your goal is a finish line, your KPIs are mile markers that signal when you’re headed in the right (or wrong) direction. For example, if your goal is greater brand awareness, upticks in your content downloads, website traffic, or social media chatter are strong indicators that your efforts are effective. If the purpose of your content marketing efforts is to generate leads, monitor metrics such as form completions, email list subscriptions, and conversion rates. Of course, these KPIs primarily focus on the big picture – the general effectiveness of your content. But it’s just as important that you also track performance data for individual pieces of content because that will help you understand which of your content types, topics, and delivery techniques are the biggest contributors to your content’s success. For example, here is a downloadable template you can use to organize the performance data you choose to track. There are many types of info you can collect for each piece of content; focus on gathering only the information that you plan to take action on. It’s pretty common for some pieces of content to be better received than others. But if your content program on the whole is failing to help your organization achieve its marketing or business goals, it may be time to revisit your strategy and reevaluate your goals. Are leads turning into customers? Your content is meant to engage, educate, and entertain – but, above all, it’s meant to bring in customers. Knowing how many leads are brought in with your content and how this equates to business value is what matters most to the C-suite. Are you saving money? A decrease in cost-per-lead or cost-per-acquisition means your program is likely on the right track. Are you keeping customers? If you’re losing customers at an unreasonable rate, then your content team may need to place a greater emphasis on content that speaks to retention rather than acquisition. Click-through rates for your calls to action: If a CTA’s click-through rate is low, consider changing the language, placement, or even colors of your content to see if that brings different results. Or, if you have the same CTA in different places and one is performing better than the other, you may want to further promote that piece of content to drive more traffic there. Lead-to-customer percentage: How many of the leads your content is bringing in are turning into customers? A low number indicates the need for a tighter sales funnel, a deeper look at the quality of leads your content is attracting, or perhaps more targeted content that will help the sales team close more and faster. Cost per lead or cost per acquisition: This is the amount your company has to spend to bring in a lead and turn it into a customer. It goes without saying that this cost should be far less than the amount of money that customer is spending. Average sales cycle duration: A sales cycle is the length of time it takes for a lead to become a full-on customer. While the initial length of a sales cycle is relative to your product and process, the shorter your average sales cycle becomes, the better your content marketing ROI. Average revenue per user: If the average amount each individual customer spends begins to dip, it may mean your sales and content teams need to focus on upselling or targeting leads at a higher price point. Customer retention/churn rate: Content marketing doesn’t end with landing a customer. A steady or increasing customer retention rate means you’re on track, while an increasing churn rate (the amount of customers you lose) should sound the alarm for more customer-focused TLC. It’s no big surprise that content marketers are feeling challenged by a lack of budget; it’s an issue that most businesses face across many of their departments, particularly smaller businesses. But is budget really the issue? In our 2015 research, we found that larger firms – which typically have more substantial budgets for content – cited each of their challenges at higher rates than their smaller counterparts. It’s possible that it’s not your budget holding you back, but how you are using the resources you have at your disposal. Turn your email outbox into blog posts. Look for emails where you are answering popular questions from customers or salespeople. Turn all your PowerPoint presentations into SlideShare presentations. Embed the SlideShare into a blog post that highlights the key points. Turn every video your company has made into blog posts and embed the videos. Create or cover a list of the top people to follow on your topic or your favorite content sources. Write about your competition or even include negative brand keywords. It’s a bold move, but if done consistently, you can rank for your competitor and negative keywords. People love lists, facts, and stats. Create a list of facts to support your business’ overarching theme. If you’d like to dig a little deeper into these challenges (and others), we’ve put together an exclusive clip from our documentary film, The Story of Content. In it, some of our industry’s brightest minds share their thoughts on what’s keeping content marketers from achieving the success they deserve. You can also download our screening kit to explore these issues in more detail. The Story Of Content: Challenges from OnScene Digital Video on Vimeo. Once you’ve identified the main challenges that may be keeping you from achieving optimal success — and their underlying causes — it’s a lot easier to break through the bottleneck and keep the killer content coming. The important thing is that you don’t give up or let minor frustrations snowball until they overwhelm and discourage you. Are there other challenges you are experiencing that weren’t mentioned? Let us know where you are struggling in the comments. You can spend an intense few days to download tips, insights, trends, and get your questions answered at Content Marketing World this September. Make your plans today and use code BLOG100 to save $100 off of the main event and all-access passes.